Popcorn Shed is the UK’s first premium gourmet popcorn brand, mixing the nation’s love of popcorn with new and inventive flavours and textures. Based in the UK and run by cousins, Laura and Sam, Popcorn Shed aim to bring an extra sprinkle of happiness to our beloved movie snack by mixing chunks of nuts, chocolates and dried fruit to the staple popcorn kernel to create a really unique taste and texture sensation. I had not heard of Popcorn Shed before, and was pleasantly surprised when my goodies arrived. The packaging really is stand-out; it’s bright and colourful, it reflects the brand personality so well and the larger packets are of course, shaped like a shed! 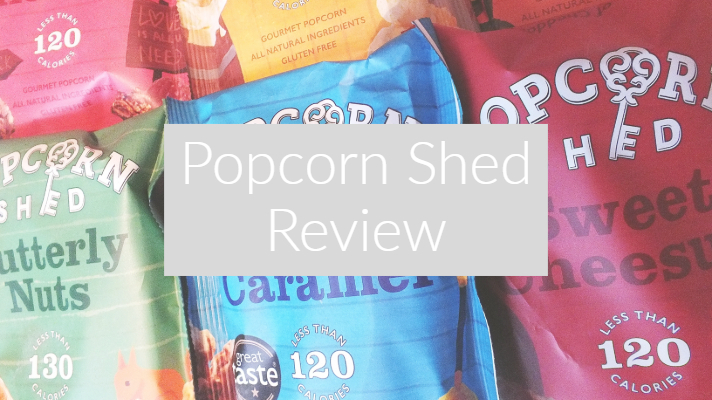 Personally, I love when brands aren’t afraid to do something different and stand out from the crowd, so before I’d even tasted the product, I was a little bit in love with Popcorn Shed. I was lucky enough to receive an 80g packet of the probably most well-known flavour, Salted Caramel. I also got a little selection of some of their smaller packets in the flavours Berry-licious, Butterly Nuts, Pop ‘n’ Choc, Sweet Cheesus, Pecan Pie and Say Cheese, so I had plenty to get stuck into and enjoy! I’ll start with Pecan Pie because this is a flavour that really intrigued me. It’s not a flavour I’d usually go for if I saw it in a shop but wow, it was absolutely delicious! The pecan pie flavour tastes predominantly like a toffee popcorn but with a nutty aftertaste. There is almost a roasted taste to it and the chunks of pecans add an added crunch. The next flavour I tried was Say Cheese. I’m not going to lie, I was sceptical about this. I usually much prefer sweet popcorn over savoury so the idea of a cheese popcorn worried me a little and I had no idea what to expect. I did end up being pleasantly surprised though! Despite the popcorn being quite soft, the tangy mature cheese flavour works quite well! It’s a strong cheese flavour but it isn’t too overpowering. This is definitely one for the cheese lover in your life! How can you go wrong with chocolate covered popcorn? Pop ‘N’ Choc uses Belgian chocolate and has just the right balance of sweet and bitter to compliment the popcorn. I found this flavour to be extremely moreish which means it’s easy to get through the whole lot in one sitting so I’ll definitely be picking more up in the future. Another Popcorn Shed flavour that I was very curious about. Caramel and cheese. I wasn’t too sure what to make of Sweet Cheesus initially as it smells very cheesy, but actually the taste is quite subtle. You get the caramel sweetness first, followed by a mild cheese aftertaste. It’s not what you would expect and I can imagine it gets a bit of getting used to! Next up is Butterly Nuts – mixing the classic peanut butter spread with popcorn. This tastes like it should have been around for years. It feels like a classic flavour combination and works so well together. It’s quite a strong peanut flavour but again, it’s doesn’t knock your socks off. Another very moreish flavour that won’t last long in this house! We all know that dark chocolate and raspberry is a winning flavour combination, but Popcorn Shed have dared to take it that one step further. Berry-licious has a subtle raspberry tang to it, with the dark chocolate definitely being the overriding flavour. It’s not too bitter or too tart, with just the right balance of both flavours. In my Mum’s words, this is an ingenious flavour combination. Definitely a hit! Another classic flavour combination, and probably the most normal we’ve tasted is Salted Caramel. The caramel is really sweet, but without being sickly or sticky to touch. The salt adds a good balance, and again, isn’t overpowering. The flavours are balanced so well as we’ve seen in most of the other products too. A firm favourite for the well-known and loved classic. Overall, I think it’s clear that Popcorn Shed really do deliver some stunning (if a little strange) flavours. One thing I will say is that all of the flavours are so well balanced with the popcorn – not one flavour makes you question whether it belong on popcorn or not, even the cheese! I adore the packaging, the brand message, the flavours… Popcorn Shed are my newest addition to movie night for sure. You can find a list of Popcorn Shed stockists here. *This product was gifted to me by Popcorn Shed. All opinions are truthful and my own. I have never been more intrigued my popcorn in my entire life. Butterly Nuts sounds like the perfect fit for me, because I LOVE anything with peanut butter. And Pop N’ Choc sounds so good also! Pop n Choc was my favourite overall I reckon, but I enjoyed all of them! Me either! They’re seriously good! I was pleasantly surprised at how nice the Sweet Cheesus was! I think I preferred Say Cheese, but they were both unexpectedly nice! Omg I have these on their way and now, reading this, I’m so excited for them to arrive! All the flavours sound so exciting! Wow so many good flavors to choose from! I’ve never seen so many different flavors on popcorn! I’m a chocolate caramel girl so salted caramel would probably be for me! Thanks for sharing! Now there is a place I would not be able to work I would eat way too much product. But wow so many incredible sounding flavors. Strange flavours but I bet I’d love pop n choc! I LOVE gourmet popcorn, and some of these flavours sound like they are to die for. I definitely wish it was closer to home. Oh yum! I love popcorn and especially love trying new flavors. Even when I think it can’t be good, somehow they make it taste yummy. I’m not a big popcorn fan, but I think I’ll give this a chance thank you for this post! I was very fortunate to collaborate with Popcorn Shed as well, and I love their popcorn! Honestly, I’ve never had popcorn so delicious before 😍 my favourite has to be Berry-licious!